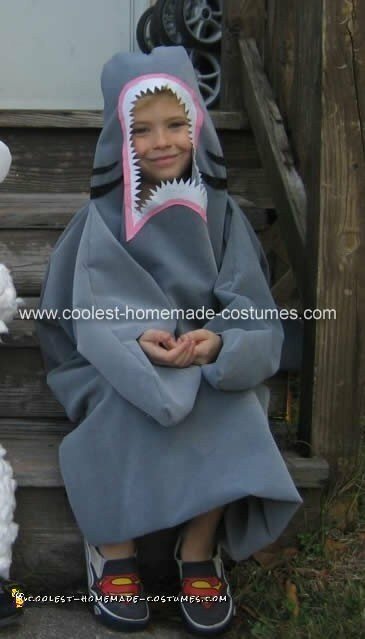 My son is a huge fan of the Adventures of Shark Boy and Lava Girl so he asked if he could be Shark Boy for Halloween. 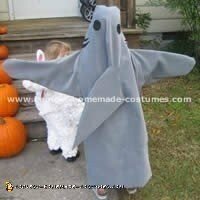 I suggested how about a shark he was sold! I went on a hunt to find the right type and color of fabric for this unique costume. I wanted something kind of stiff. It was almost all made on the sewing machine. I kept having to try it on him to make adjustments to the mouth and length which was the only drag because I do all my sewing during the day while he was in school. 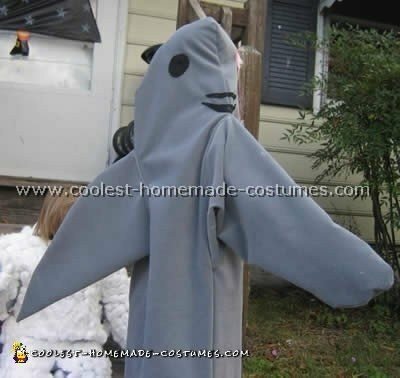 I decided how big and what shape fin I wanted and then once it was put together I put cardboard in it to try and keep it stiff then I sewed it on. The eyes and gills are glued on black felt and the mouth is sewn on white felt with pink paint around the edges for gums.